Once again Toyota has come under fire, so to speak, because of a manufacturing/design defect in some of their vehicles. 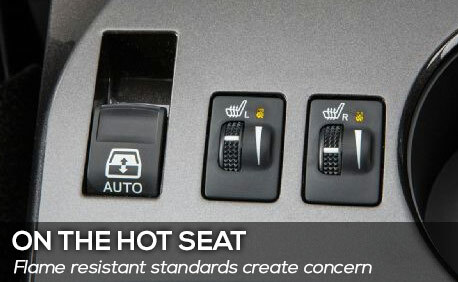 The problem is that the materials used in their heated seats – such a welcome luxury this time of year – are not as flame resistant as required by U.S. regulatory standards. Toyota has issued a stop-sale order to their dealers for the affected models, which include the Camry, Camry hybrid, Avalon sedan, Avalon hybrid, Corolla subcompact, Sienna minivan, Tundra and Tacoma trucks made since August 2012, when the fabric supplier was changed. So far there hasn’t been a recall of cars already on the road.